The only Digital Media system built from the ground up to generate revenue. An industry first complete solution. The platform, the products and the process. Grows audience, grows revenue and reduces costs. CityPortals is a solutions provider vested in your success via a partnering approach. Allows you to build detailed, company owned advertiser profiles of all businesses in the marketplace. Tools and Dashboards allow managers to increase sales productivity. Tied into CRM and Advertiser Products. Integrates into your current billing platform or can stand alone. Integrates with all ad banner serving platforms, including Google DFP-SB, DART, OAS, AdTech, FatTail. Also includes built in ad banner delivery and reporting system. Tracks detailed performance analytics for your advertisers. The entire platform has been built designed to maximize search performance. Profile system which tracks and collect detailed metrics (DATA) on your visitors and their detailed activity. Best of breed Content Management System that’s easy to use keeping your content fresh. Completely configurable pay wall that interfaces with your current subscriber database. 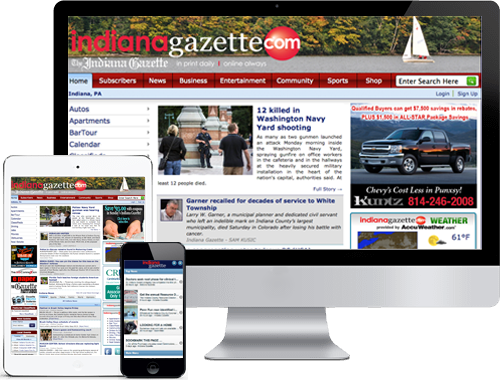 I discovered what the CityPortals team was doing with their own site StateCollege.com and was impressed, I wondered if they could re-create their success in my newspaper market. We put together a deal, and we have been extremely pleased with the rapid audience and revenue growth. They have over delivered on what they promised and how often can you say that? " We are very excited about the CityPortals platform. Its comprehensive approach for providing all the important pieces required to build local digital dominance is unmatched and truly a first in the industry. But the real proof is in the actual results. And simply put, the results have been amazing! via Platform, products, SEO, SEM, SMO. Continual process improvement & training available to your sales, editorial and digital team. Built in products and Search Engine Optimization so that your Audience that is looking for these products will grow and your advertisers will love the results they receive. The dominance in search our platform provides is the key to audience and revenue growth. Your expenses will go down and you have better management insight into your digital business. If you are interested in becoming a partner, please contact us to schedule a discussion on how we can work together. Get Free Analysis and Quote.